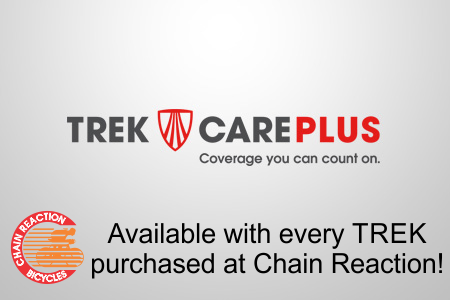 TrekCarePlus FAQ- Affordable Wear & Tear & Accident Coverage for your new Trek! Protect your new Trek bike from accidental damage while riding, and get free replacement of many common wear & tear items! If you ride a lot, you could save hundreds, even $1000+ on cassettes, chains, wheels & more. Just $49 – $499! Available for purchase September 3, 2013, but may be added to any bike purchased 60 days prior. What’s covered under Wear & Tear? Wheels including spokes, rims, hubs and quick releases. Drive train components including front and rear derailleurs, freewheels and cassettes, chains and shifters. No. Most things are but brake pads, tires & tubes are not covered. What if my bike is on my roof rack and I run it into the garage? Sorry, you’re not covered. You must be riding your bike when the damage occurs to be covered. What if I’m cruising the local single track on my Madone and I taco my rim? Is that covered? No. You must be riding your bike in the way that it was built for. If I crash and my frame cracks because of the crash is that covered? Does Trek Care Plus extend the original manufacturer warranty? Yes but inclusive of the original warranty. Meaning that if the original warranty was one year then the extended warranty is a total of 3 years (2 years added on). It will not extend an original warranty that is 3 years or more. Coverage starts the day that the plan is purchased. Because a customer might purchase the plan up to 60 days after the purchase of the bike the coverage ends three years after the purchase of the bike. What? The consumer has 60 days after the purchase of the bike to come back and buy Trek Care Plus? Are accessory items like bags or bottle cages covered? No. Only parts that are needed to actually operate the bike are covered. Is there a limit to my coverage? Yes. The total amount for all claims cannot exceed the purchase price for the bike. From a practical standpoint this will never be an issue for wear & tear, but does place a limit on the number of frames you can destroy through normal road use, including accidents. Someone racing, who might literally destroy a frame a year, will likely get just one replacement (since a frame represents a significant part of the cost of a bike). This program is a no-brainer for people who ride a lot! The big savings will be in chain, cassette & chainring replacement, with the added benefit of accident damage thrown in for good measure. If you’re wondering why the pricing ramps up rapidly for the more-expensive bikes, it’s likely due to the expense of replacing high-end carbon road frames. But again, keep in mind this does not cover bike-car damage, ever. If you’re going down, aim for something other than the car. Better yet, don’t crash in the first place. Remember, this covers only Trek bicycles, nothing else, and only Trek bicycles you’ve purchased new from us within the past 60 days. I’m interested, I just bought a new 2013 Trek Fuel EX8! Attempting to purchase Trek Plus Coverage but at the top of your page it says no longer available! Is this true? I just purchased a Trek Neko SL from Bike Rack in Flowood, MS on Oct. 24th and the coverage was one of my buying points. THEY are the ones who made the referral. Please advise. I just filed a claim and the guy who wrote it tells me it could be months before I hear anything. 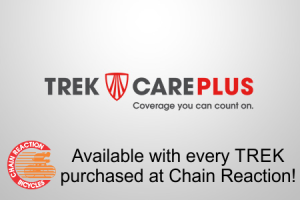 I heard all this great stuff about Trek Care Plus and nothing about such a long wait. Do they add that time to my 3 years? Does it seriously take months for the company to respond to claims? I have nothing else to ride right now. Love my Domane 2 but this is bad news. Thanks. R.T.